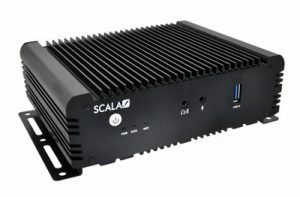 Scala, Inc., part of the STRATACACHE family of digital media/ad tech solutions companies, today unveiled the addition of Scala Media Player hardware to its digital signage portfolio. The addition of Scala-branded players gives customers a comprehensive, end-to-end solution to create, deploy and manage successful digital networks in a smarter, more streamlined way. Scala designed the players for optimal performance according to market needs, and will draw on the experience and expertise of parent company STRATACACHE to develop and distribute the new media player hardware. The new software and hardware solution eliminates the complexity of managing and deploying content to a diverse digital signage network, and supports ongoing growth. STRATACACHE is based in Dayton, OH, and serves 28 countries with offices in San Francisco, Los Angeles, Chicago, Bentonville, Dallas, Calgary, Toronto, Montreal, Vancouver, London, Hong Kong, Tokyo, Adelaide, Luxembourg and Bangalore. You can learn more about STRATACACHE and its family of companies, Scala Inc., PRN, Carmanah, Optika, SuperLumin and enVu here. This entry was posted on Thursday, November 30th, 2017 at 11:48 @533 and is filed under DailyDOOH Update. You can follow any responses to this entry through the RSS 2.0 feed. You can leave a response, or trackback from your own site.